We’re closing out computer organization month here in the Organize and Refine Your Home Challenge with a bang…ready for password organization week my friends? In case you missed all the fun we’ve had whipping our computer into shape over these past few weeks, you might want to check out the assignments for computer desktop organization, email organization and creating a computer backup system first. Once upon a time, maybe a decade or two ago, it might actually have been possible to keep a running list of usernames and passwords for our internet life in our head. Today? Not so much. Case in point: how many times over the past week have you had to resort to resetting your password on a website because you weren’t able to recollect it from memory or locate that scrap of paper that contains it? If you’re someone who spends an insane amount of your working life on the computer (like Moi), the password struggle is made exponentially more difficult, since you have so many more accounts and online tools to juggle. If you don’t have a system for managing passwords, let’s change that today. There are several password organizing methods to choose from, ranging from low-tech to high tech. Let’s explore those options, then you can choose the one that will work best for you. Purchasing a paper password organizer is a simple way to keep track of userid’s and passwords for your various accounts. Look for one that has a blank cover so that it won’t attract attention if you happen to be carrying it around in a public setting. Since it’s good practice to change up your passwords on a regular basis, be sure to record the information using pencil. Once you’ve printed out the necessary number of pages and indicated your category at the top, staple/clip the pages together (or slip the pages in page protectors and store in a binder if you prefer). As you come across a new online account, just fill in the information for that account on the appropriate sheet for that category. In addition to filling in the userID and password for each website, don’t forget to record the email address that’s associated with the account. If you have multiple email addresses, this will save you the aggravation of trying to remember which one you used to establish that particular account. For years, I used a password-protected spreadsheet to manage my password information. I shared the spreadsheet with my husband via Dropbox, and kept a print version of it near my computer for reference. Andrea Dekker’s spreadsheet organizes passwords by category (e.g., Utilities, Money Accounts, etc.) within separate worksheets. I love the level of detailed information that’s captured within this spreadsheet. There are columns to record security questions and answers for each account, as well as contact information for each company. 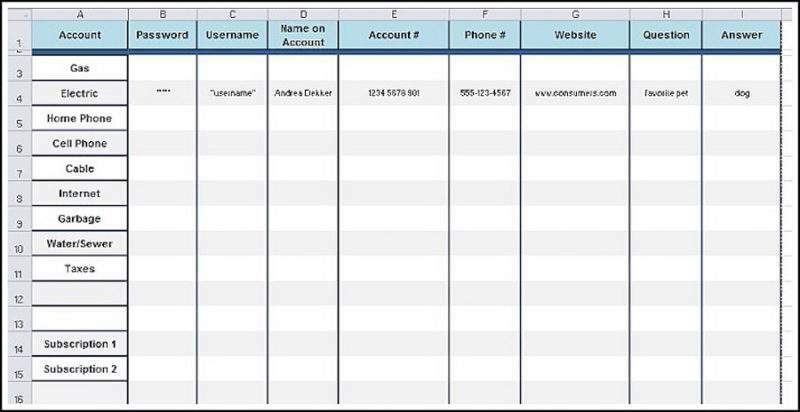 She provides a template version of the spreadsheet that you can customize to suit your needs. During this past year, I made the switch from spreadsheet to an online password manager. As a blogger, I find myself logging in and out of websites all day, everyday. With all of the time I spend online, I needed a tool that can expedite the login process, since flipping through page upon page of my password spreadsheet hardcopy was hampering my productivity. Online password managers typically install as a browser plugin. When you log into a secure site, the password manager offers to save your credentials. When you return to that site, they autofill your password. 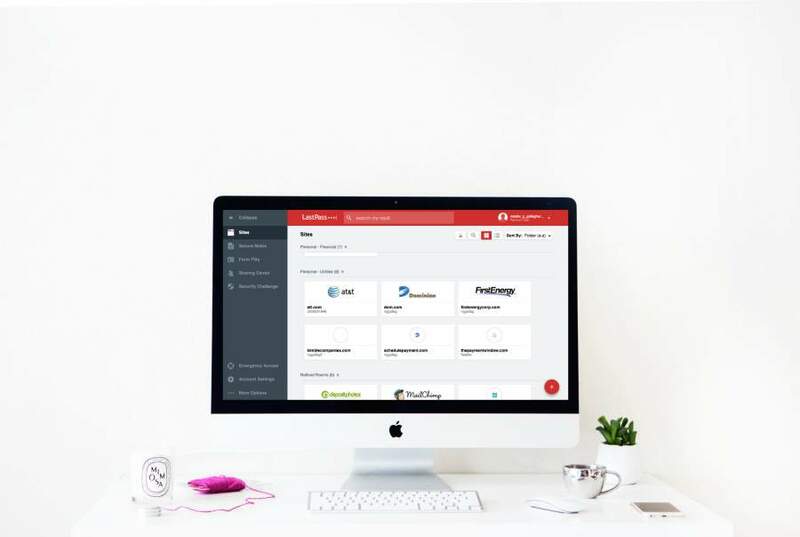 You can learn about password managers and see a recent review of the best password managers here. I’m a LastPass Girl myself. I can barely remember what life was like pre-LastPass, but I know I never want to go back! No passwords to remember (except the one that opens my Master Vault), no racking my brain to come up with uber-secure passwords. No need to periodically go into all of my accounts to change passwords. LastPass does it all for me. 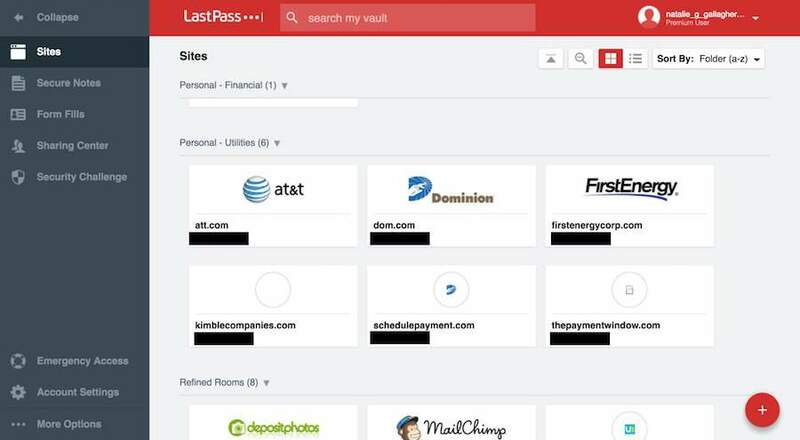 The basic version of LastPass is free. In my opinion, it’s sooo worth the $12 annual premium fee to sync my LastPass account across unlimited devices. I’m well aware that many of you are uncomfortable with the idea of a digital password manager. It’s not for everyone. The good news is that when it comes to managing passwords, you’ve got choices. Choose the method that you feel most comfortable with. We’re all familiar with the stories about major data breaches and identity theft. Yet, good password management is something that most of us don’t devote enough attention to. Just like there are best practices for computer backup, there are a number of Password Do’s and Don’ts that we should keep in mind in order to protect ourselves. If you’re still using your child’s name as your password, or using the same password across multiple accounts, take a moment to read up on some best practices for password management. Follow password best practices from this point forward! Let me know which password organizing solution you’ve chosen to use below in the comments or in the Organize & Refine Your Life Facebook Group! I came here via Pinterest and thought I’d print out your free Password organization printable (Thank you, it’s lovely). I did download it and print, BUT, as I scrolled down to leave a thank-you comment, I saw what you’d written about Last Pass. This looks awesome, so I signed up immediately. I do hope it’s an affiliate link! I’ve never been more excited about passwords before. Keeping them on a printable has been fine, but messy and tedious to find the one I’m looking for. Last Pass looks awesome, and perfect for someone like me. SO MUCH nicer than having them printed out – and tidier. I admit that there will likely be a transitionary period where I still keep things written down, just in case…but I’m very much looking forward to transitioning away from paper for these. I love Dropbox for my most important files (I’m an author)…why would I use paper for something as important as my passwords?! Thank you – excellent, and very helpful post.